Durable and adjustable. Doctor-recommended. The premier back support for over 60 years. This is the only portable sitting support proven to hold up to heavy use by bus drivers, law enforcement officers and mobile salespeople. It's guaranteed by a 5 year manufacturer's warranty. 12" wide (BRN). For extremely bucket-shaped seats. We rarely sell them. 15" wide (BRS). The most popular size. 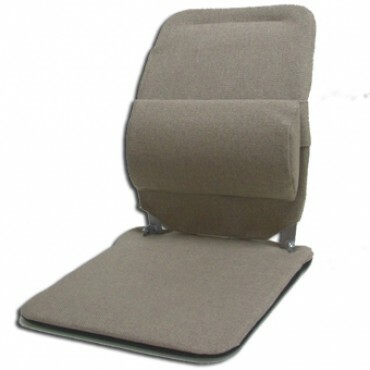 Fits in most bucket seats and also works on couches, overstuffed chairs, wide auto captain's seats, bus and truck bench seats. Accommodates most people of average build. If you have a very stocky build your body may come in contact with the steel frame, in which case you should get the wider 19" size. 12" back with 15" seat (BRSN). Combines a narrow back with a standard seat. Specially designed for the most narrow-backed bucket seats. 19" wide (BR).These models do not fit into bucket car seats. 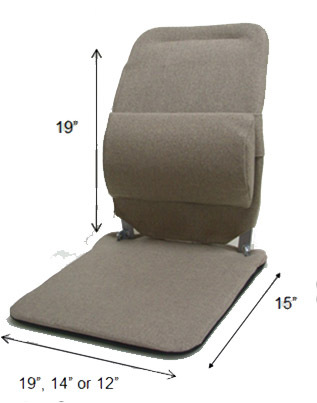 They fit wide or flat seats like couches, overstuffed chairs, wide auto captain's seats, bus seats and truck bench seats. This size is also the best choice for people with a stocky or large body type. If you have a bucket car seat and a stocky body type, Sacroease won't work for you.